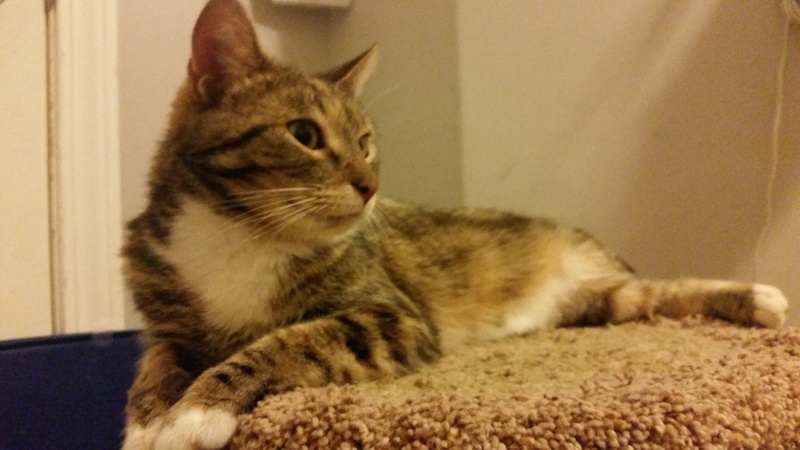 Gina and the Kitten Search – The Cat Next Door Inc. Sometimes, the coolest thing happens. We are a local professional pet sitting service in Airdrie, Alberta. We are also often called on to help with different household pet problems, such as lost or stray pets. We are actively involved with our local animal shelters and residents in the community with their pets. Usually the help we offer is more of “front line” volunteer work such as transporting injured and lost animals to the vet, and helping find lost pets. I often refer to Melanie as “the real life Ace Ventura.” When it comes to animals, our hearts are as big as they can get. We are also owned by several pets ourselves, most of them rescues; Cats, Dogs, Fish, Crested Geckos, a White-Lipped Tree Frog and a Bearded Dragon. Many times I’ve been with Melanie on the phone and she’ll say something like, “Dog. Gotta go”, and an hour or two later I get filled on something she did to help an animal in trouble. Sometimes our hearts get broken, like the times we can’t save the animals or can’t find the lost pets. This memorable search started at the end of September when Melanie received one of her typical messages that there was a scared grey cat around a nearby condo complex. Melanie was given the location of where this cat was spotted but after several attempts, this cat was not found. A few weeks passed by and we finally received another message about the scared grey cat. 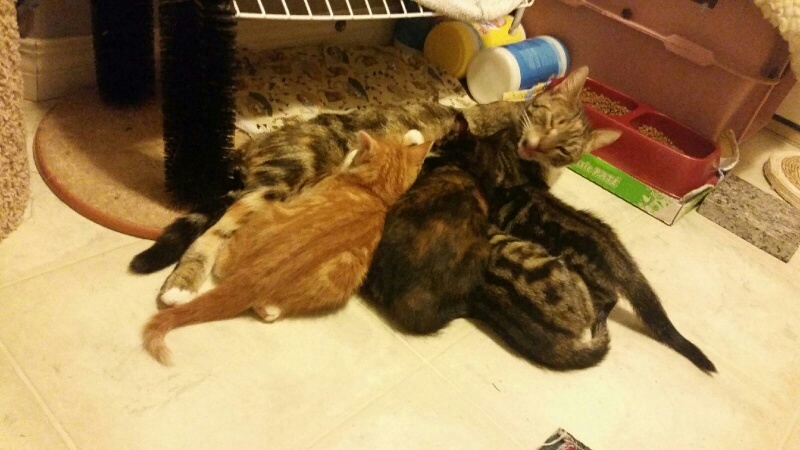 This time, 4 young kittens were reported to be with her. The adult cat was seen going back and forth from one of the resident’s front porch, as there was plenty of space to go to hide underneath the front steps. Melanie gathered her supplies and went to the condo location but once again, could not spot any cats. 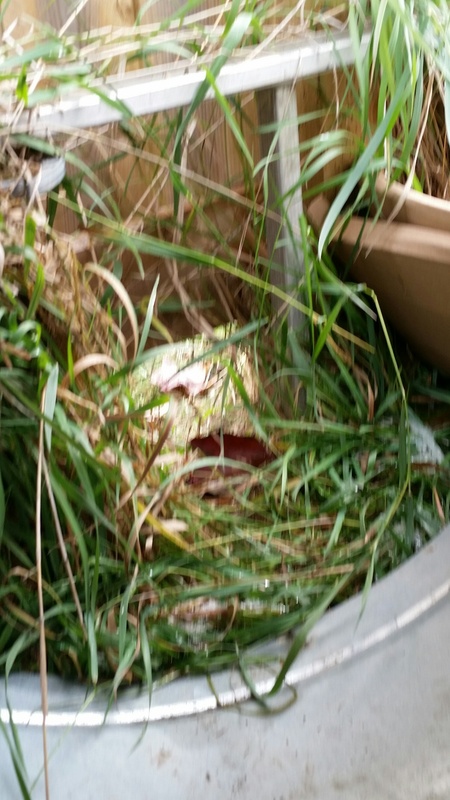 While she was driving around this area, she noticed an animal carrier at the side of someone’s house. She decided to go and ask the home owner if they were aware of the carrier. To our surprise he was aware and described what he had seen. A neighbor of his placed the carrier there and had been watching this mama cat and kittens for the past few weeks. The man who lives there is very kind, and he was great about letting us set up to try to catch the cats. Melanie set up her cat trap, and put it along the side of his house. Melanie and some nearby residents checked the trap regularly. 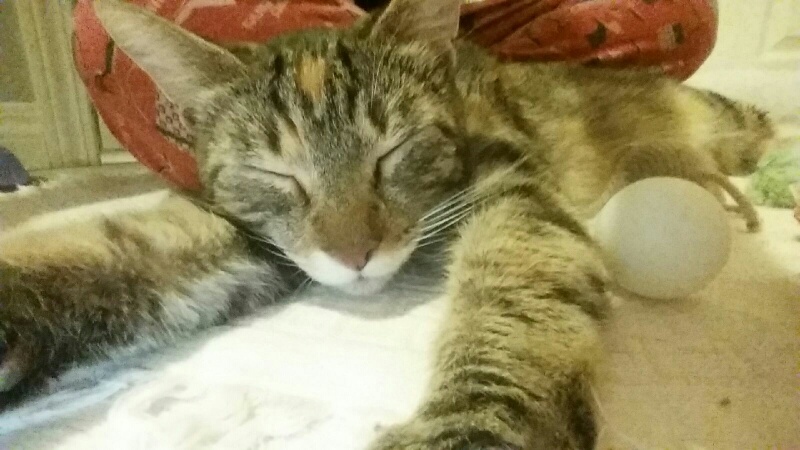 During the first day of caring for the mother cat, Melanie had her name – Gina. She thought of this because of the first treat she ate out of Melanie’s hand. They were the original flavor temptation and Melanie noticed the name Gina in the word “Original.” Gina is definitely an original! 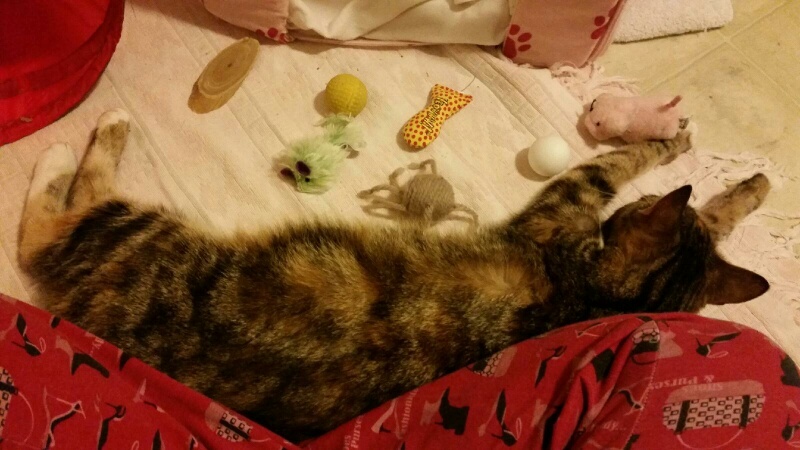 We knew we couldn’t keep her at the resident’s front door for too long, as we needed to get her somewhere warmer and more secure. We had a plan for Gina to help us find her babies. We took Gina to our home, emptied out a room, and gave her a good setup so we could care for her while we continued the search for Gina’s 4 babies. 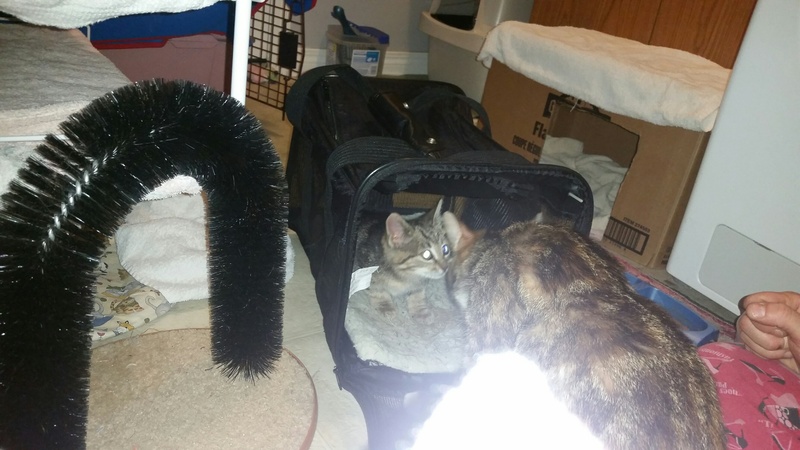 We have a pet stroller at home that came in very handy for this, as Melanie took Gina out in it every day to the areas where her kittens were spotted. The bond between Melanie and Gina developed very quickly. Although Gina was calm and friendly towards Melanie, she was still very restless, and we noticed she didn’t sleep much. Melanie posted on many lost and found community Facebook pages about the missing kittens and asked for the area residents to keep an eye out for them. Now there were more people in the area keeping an eye out for the kittens. Melanie started to receive many messages about new kittens being spotted. 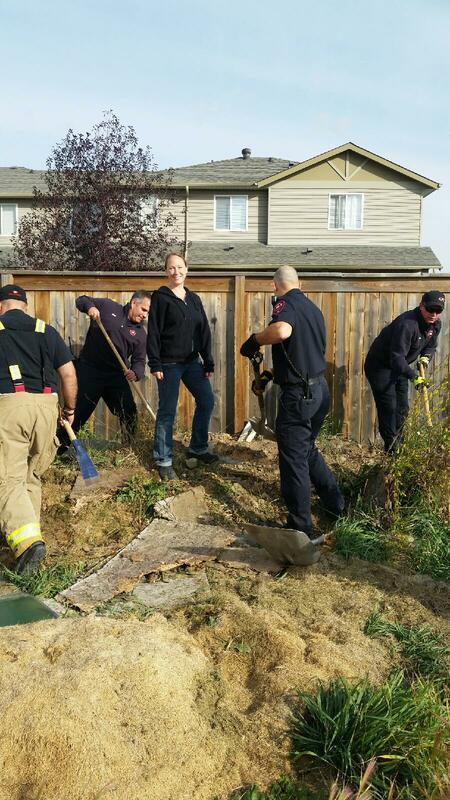 That’s Melanie, standing on the hill while the firefighters dig around her. At the retirement home about a block away from the condos where Gina was found, some workers saw kittens running around a construction site. 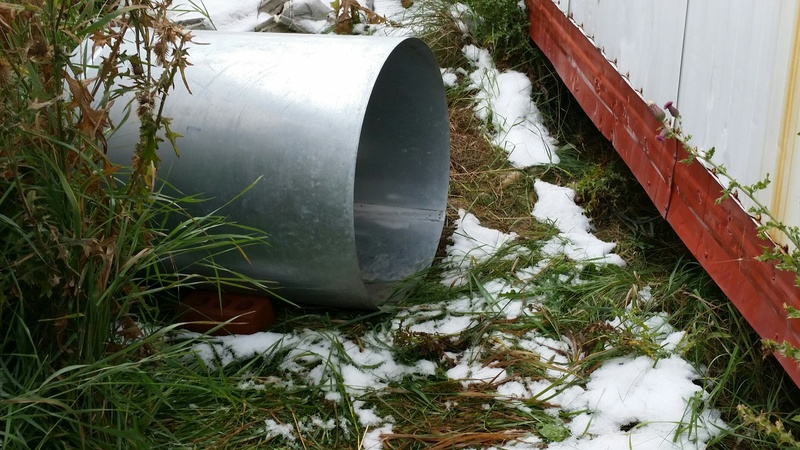 When people showed up to get them, one of the kittens ran into a pipe. Hoping they would help, Melanie called the fire department. To her surprise, a whole crew showed up! See the blue pet stroller? That’s Gina in there. 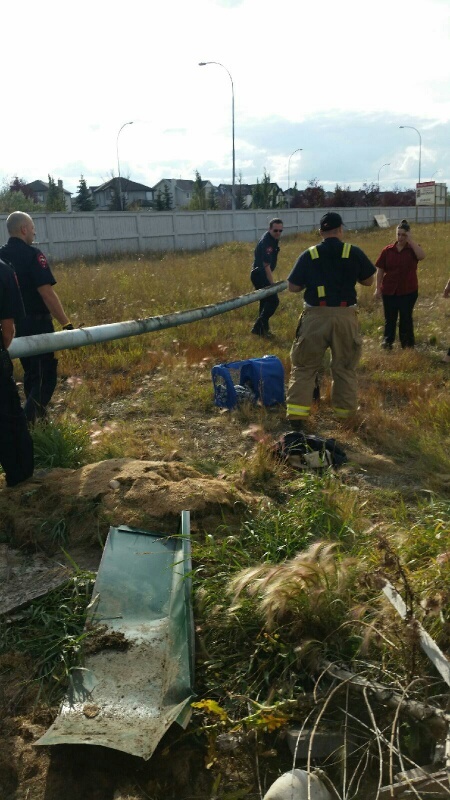 7 fantastic fire fighters in Airdrie came to the rescue. Also there was a wonderful lady we met recently, who’s Facebook post on the kittens helped us all keep track of who was checking traps next and what the results were. She too is a pet lover, and was very helpful during this process. In the pipe was a mostly black kitten, but on closer inspection, it was a little torti. Now the question, was this one of Gina’s babies? After viewing the picture, some people thought this was Gina’s baby while others didn’t. Melanie showed the kitten to her, and Gina began to groom the kitten, so Melanie placed the little torti in the stroller with Gina. We had found baby #1 (later named Summer). There was still speculation as to whether this baby was hers or did she want a baby so badly that she became a surrogate to this one? Gina with her kitten, Summer. Willow and Hunter, not Gina’s babies. Melanie was determined to find the others. One kitten trap wasn’t going to be enough. She purchased 3 more and placed them at different areas around the construction site. To add to the urgency of finding these kittens, it was announced that construction was to begin at this site in the very near future. The kittens had already moved once and we didn’t want to lose track of them. We would have to find the other 3 of Gina’s babies quickly. October 6th was another breakthrough day. 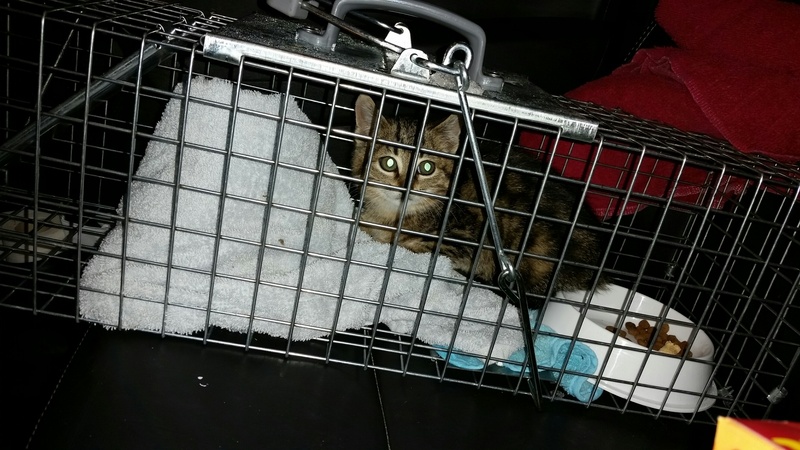 A woman contacted Melanie with the news that one of the kitten traps had a small grey tabby in it. 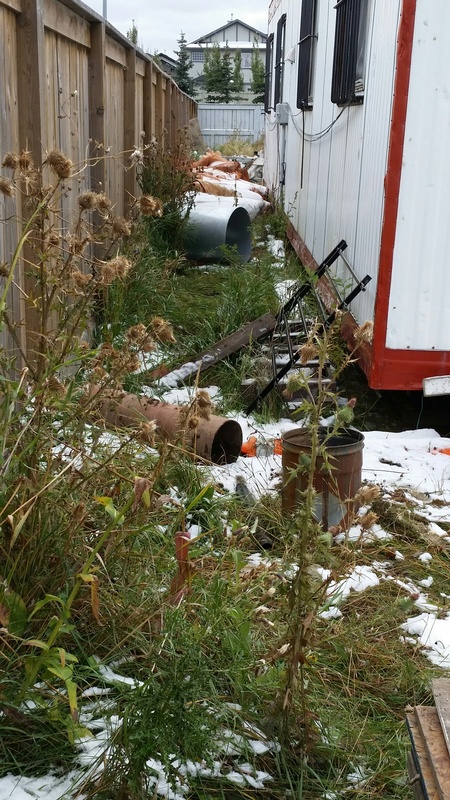 It was the trap that was behind the red shed at the retirement home. Once again, Melanie introduced the kitten to Gina. We found baby #2 (named Chase). 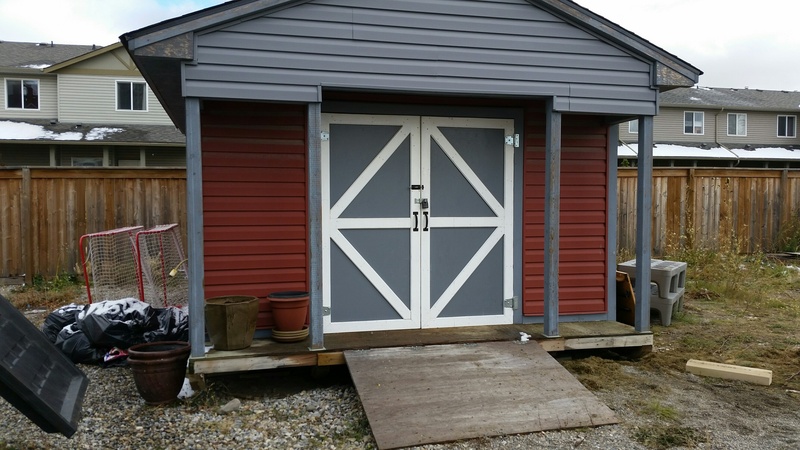 Red shed where Chase was trapped. I stopped by to check the check the traps around 8:30PM, just in case. I was almost done checking the first two traps, when I heard rustling by the 3rd one. I walked as quietly and gently as I could. I remembered how I’d heard that one of the ladies accidentally startled one of the kittens (Chase) in the middle of the night earlier in the week. I didn’t want the same thing to happen now. I got about 8-10 feet away from the trap when I suddenly noticed a wide, fluffy black and white tail bobbing around in the tall grass. Realizing this was a skunk, I got back to my car and decided it would be best to come back in a little while. Later that day, Melanie was contacted again. This time, another grey kitten was found. This one was found by the road by a mom and her daughter. We had to check to see if this was baby #3. Melanie brought this little grey kitten in to see Gina. It was just like the time she met the 2 kittens from the vet in Calgary. She instantly rejected the kitten, and began hissing and growling like she did with them. This was definitely not one of Gina’s kittens. Although it was sad when she would reject some kittens, we were fascinated by her reaction when she would recognize her own. 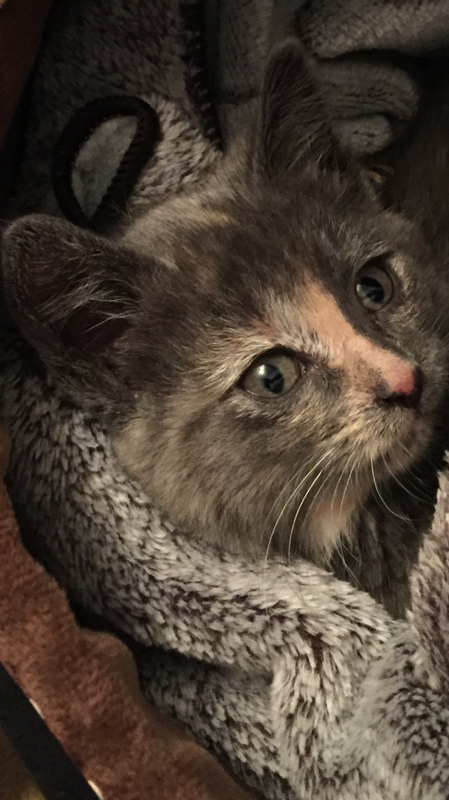 This sweet little kitten was taken to the Cochrane Humane Society so they could get it some medical treatment and then would be up for adoption. With Gina at home caring for her 2 kittens, our search continued for the other 2 babies. While Melanie was out trying to find the kittens that same night on October 6th, I checked Facebook one last time before bed. 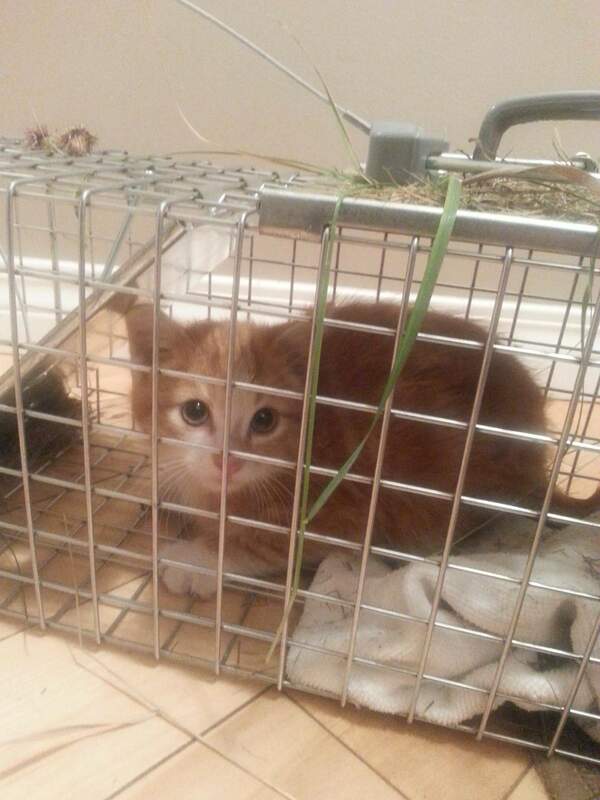 A woman was trying to reach Melanie to tell her that she took one of the traps home, because we had another kitten! This time, it was a feisty orange and white kitten. I contacted the woman, told her who I was and left to picked up the kitten. I met Melanie back at the house where another introduction was made with Gina. It was another success. We had just found baby #3 (later named Autumn). 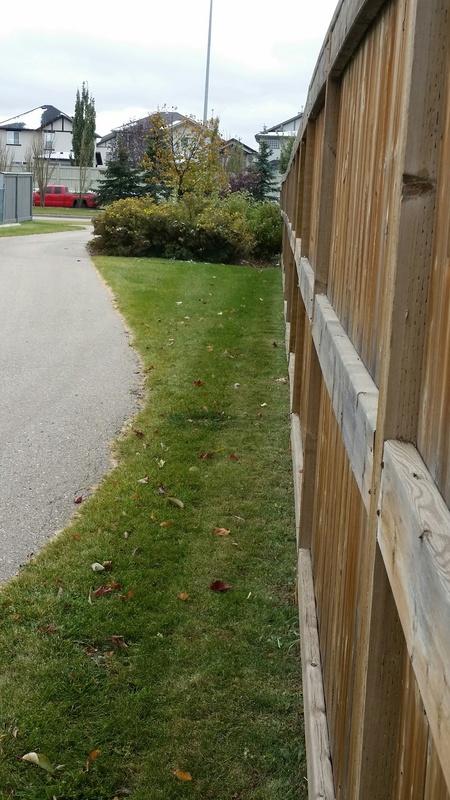 Autumn greeted me with lots of hissing. 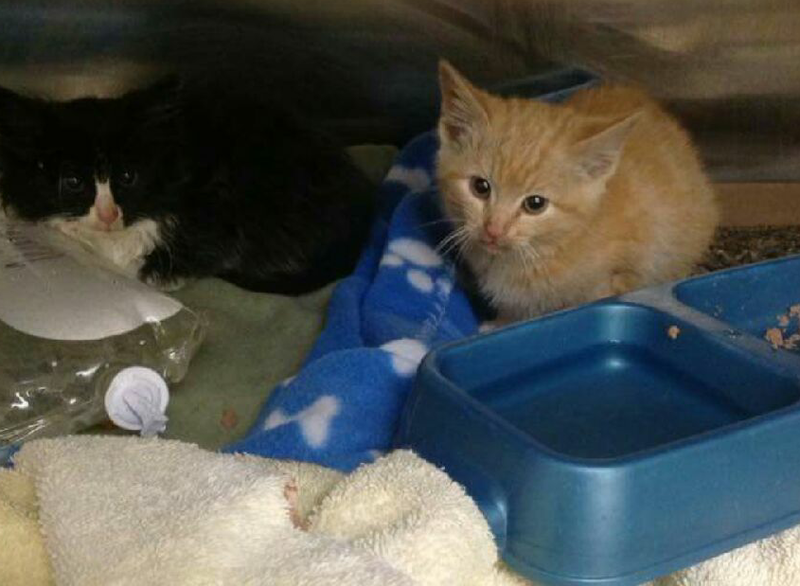 These little kitties were going to need some serious re-socializing! So we still had only 3 kittens out of a reported 4. The weather had turned cold and we had out first snowfall. A very brave lady in our community came and released the skunk from our trap. I was glad it was Friday now, as I could spend my weekend helping look for this last kitten. Later that evening I stopped by and checked the traps to find that they were still empty. Location where small paw prints were found in the snow. Location where paw prints were found. Utilized some material found on site. This was a great location to move a trap to. By the time we finished prepping the traps, it was 2AM on Saturday, October 8th. We checked the traps again at about 2:30AM, saw they were still empty, and left. I decided to take a quick nap so I set my alarm for 4AM so I could check the trap again. I decided that I would check the traps every 1-1/2 to 2 hours, and I wanted to give Melanie a much needed break since she had done so much herself. I went to the construction site and checked traps 1 and 2. They were empty. I approached trap 3 that was in the big silver tube. I could see that the trap had been tripped. As I walked over, I was so nervous. What if it was the skunk again? As I got closer I peeked into the tube with my flashlight. 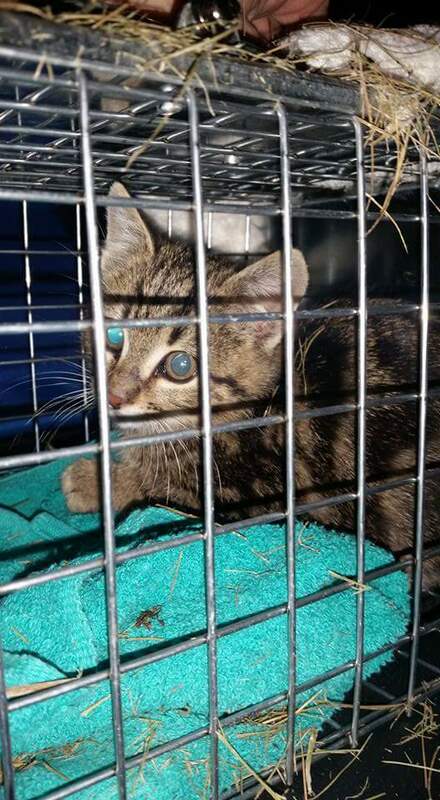 I can’t even describe what I felt when I looked in that trap and saw the sweetest little kitten face looking at me. Of course because we had a couple of false attempts, we had to introduce this kitten to Gina to make sure it was hers. I called Melanie immediately and when I brought the kitten back, we visited Gina for confirmation. I’ve never seen anything like this before. I didn’t witness when Gina met her other three babies, but this time I was there. Gina confirmed that this was her kitten. There was something so special in the way she turned and looked at Melanie. All 4 of Gina’s babies were with her now. Gina, who had been so incredibly restless (just like us), finally slept. Not even interested in the toys. We are fostering Gina and her kittens for the Cochrane Humane Society. They are safe, happy, and healthy with us, and have been vet checked. Gina was dewormed and received her first set of vaccinations. The kittens need more socialization before they go back to visit the vet as they were a little wild to handle. We are giving them lots of love and making sure they are well socialized so they can go in for their full vet checks and treatments. Gina, with all of her babies: Summer, Chase, Autumn and Storm.